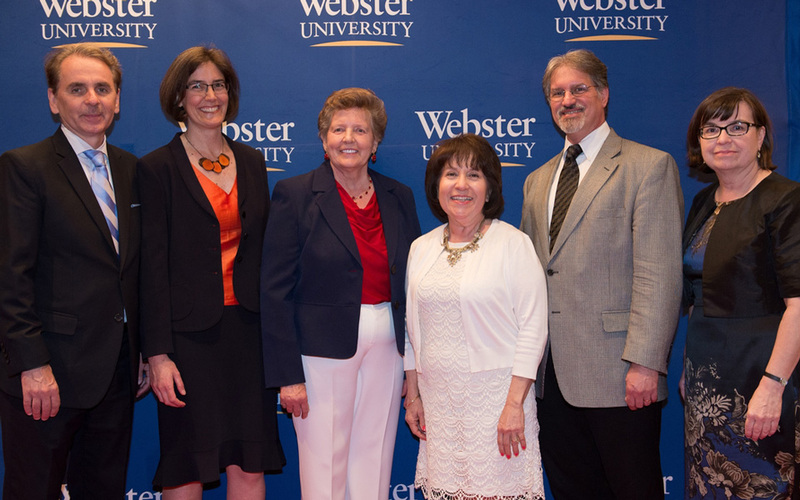 One of Webster University's traditions before the annual commencement is to recognize five faculty members with Webster's most prestigious faculty awards, the William T. Kemper Award for Excellence in Teaching and the Wilma and Roswell Messing, Jr. Faculty Award. All five recipients were honored at the annual commencement dinner and on other occasions throughout the weekend. The Kemper Award is awarded each year to two full-time and two part-time faculty members at Webster University who demonstrate teaching at its finest. Nominated and supported by students and colleagues, they are selected by a committee of their peers for their outstanding teaching. The award is funded by the William T. Kemper Foundation. Thompson’s nominators describe her creative approach to developing course material that motivates and challenges her students, conveying challenging material with clarity, and engaging students in lively, thought-provoking discussions. She respects her students as individuals, and as a result, they learn and progress not only in their academic skills, but also in their growth as human beings. "Fostering interest in French requires a balance between developing students’ initial affinities and challenging them to question their preconceptions by delving deeper into what seems most alien," said Thompson, when asked about her teaching philosophy. "By cultivating confidence, know-how and empathy, I prepare students for as-yet-unknown domestic and international opportunities." Umbaugh approaches his students as individuals, engaging in deep and reflective discussions about their work. His nominators described his tireless work as a Learning Community faculty member, using his academic partner connections to grow the program. He championed the adoption of the Global Citizenship Program, Webster’s general education program, and continues to champion its continued development, including ensuring that the curriculum happening inside the classroom also extends outside the classroom. "I want to help students find endeavors they love, develop knowledge and skills to be effective, and make a positive difference in the world," said Umbaugh when discussing his teaching approach. "I am proud that long after being in my classes students think about problems and ideas we discussed, that they continue to learn, and that they feel free to come to me as someone who can still be their teacher in one way or another." Riley teaches courses in management and human resources at Webster's Fayetteville metropolitan campus location. She possesses the unique perspective of heading President Ronald Reagan’s 20 member task force charged with writing Title I of the Americans with Disabilities Act. Her nominators describe how she brings this impressive breadth of experience into the classroom term after term. Riley has a talent for bringing out the best in her students—challenging them to engage both with the material and their classmates to create a vibrant, motivating experience. Many graduates praise her courses as the highlight of their program. "My students are my first priority," said Riley. "I strive to create a challenging learning environment by designing teaching scenarios that build an instrumental mosaic of activities. My vision of the educational process is a key factor in building the students' self-confidence, self-esteem and assists each student in achieving their educational goals." Stephenson's ability to connect with students and create an engaging and thought-provoking environment is accomplished by her genuine interest in students’ thoughts and concerns. She actively brings culture into the classroom, as well as taking the classroom into the culture. Her nominators describe how her determination and care for Webster students has contributed to the well-being of current majors and even contributed to increase recruitment of new International Languages and Cultures majors. "I strive to have a student-centered classroom within an integrated and task-based approach," said Stephenson. "The cornerstones of my philosophy of education are active and experiential learning, varied assessments and use of technology and innovative techniques to keep students thinking, connected, engaged and inspired in an environment of mutual respect." Seoyeon (Celine) Hong, assistant professor in the Department of Communications and Journalism in the School of Communications, was the recipient of the Wilma and Roswell Messing Jr. Faculty Award. Read about her proposal to present in Japan here.